Most residents hunker down, but some venture out for the experience or because the job calls. 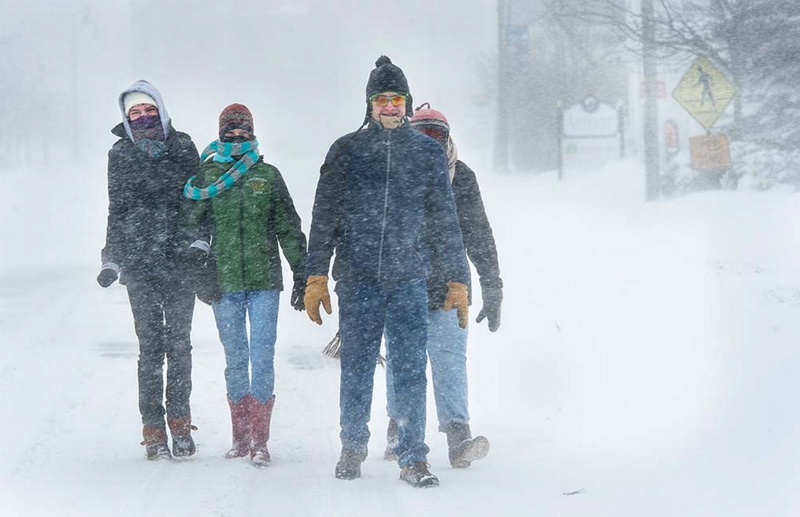 Jack Milton/Systems Editor Molly, Maeve, Christian and Tandy Ratliff walk home on Ocean Street in South Portland after having breakfast at a local coffee shop during the blizzard Tuesday. The blizzard that dropped 2 feet of snow on parts of Maine largely kept people indoors and off the streets, but some hardier residents braved the elements and ventured outdoors. YOU CALL THIS A MAJOR STORM? Jimmy Morrill, 64, a lobsterman and clam digger in Yarmouth, scoffed at the storm. And after school, he said, he would play outside with his friends. The flagship L.L. Bean store was apparently the only retail spot in Freeport that was open Tuesday, but it wasn’t exactly busy. Karl Ramsdell, 39, and Kristen Ockenfels, 30, were dressed in full snow gear and on their way to buy sleds. “We’ve been waiting for a real storm so we can go out and play,” Ramsdell said. Tim Delorme was part of the skeleton crew working at the L.L. Bean store, which had one employee in each department. “We have 200,000 square feet to cover, so we need a few people,” he said. Delorme started working at about 6 a.m. and said only a couple dozen or so customers had come in. “But we have a tradition of being open, so it’s kind of fun to be a part of that,” he said. Tuesday’s storm was significant, but Delorme said the blizzard that hit two years ago was worse. Even though few customers browsed the store, the phone attached to Delorme’s hip kept ringing. One caller was looking for a very specific type of sock. In Brunswick, Samantha Stalder, a Bowdoin College sophomore from Orange County, California, was taking the blizzard in stride. She still had two classes scheduled for Tuesday afternoon but wasn’t upset about it, even though her friend and housemate, Kyra Silitch, who grew up in New York City, had all her classes canceled. “There was so much hype, I didn’t really know what to expect,” Stalder said inside Moulton Dining Hall on the Bowdoin campus. The policy for classes, according to students, is simple: If a professor can get to class, they are going to teach. Many Bowdoin professors live in Brunswick, some within walking distance. Stalder and Silitch said the walk from their house, an old fraternity house across Maine Street from campus that they share with 24 others, was the hardest part. Silitch said the best purchase she made when she got to Maine was a long coat. Stalder said she couldn’t live without her hat. The two students said they plan to hunker down at their house as the afternoon wears on. “We’re going to make cookies,” Silitch said. Few people were out Tuesday morning on Portland’s Eastern Promenade, site of the city’s popular sledding hill. 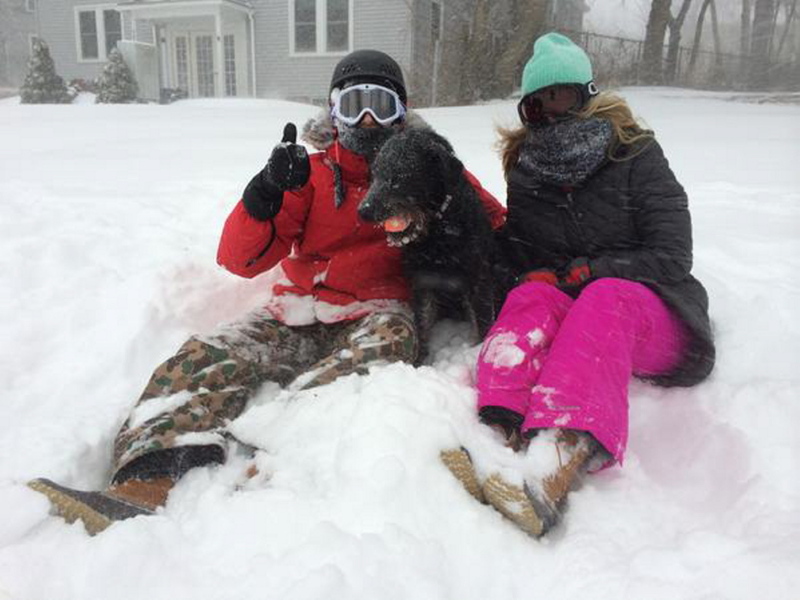 A couple who recently moved to the prom from Kentucky, however, relished their first major Maine snowfall. “She’s been here three days,” Daniel Hawkins said of his girlfriend, Taylor Fleming, as they romped in the snow in front of their house with their dog, Eli. “I think it’s great,” Fleming said. 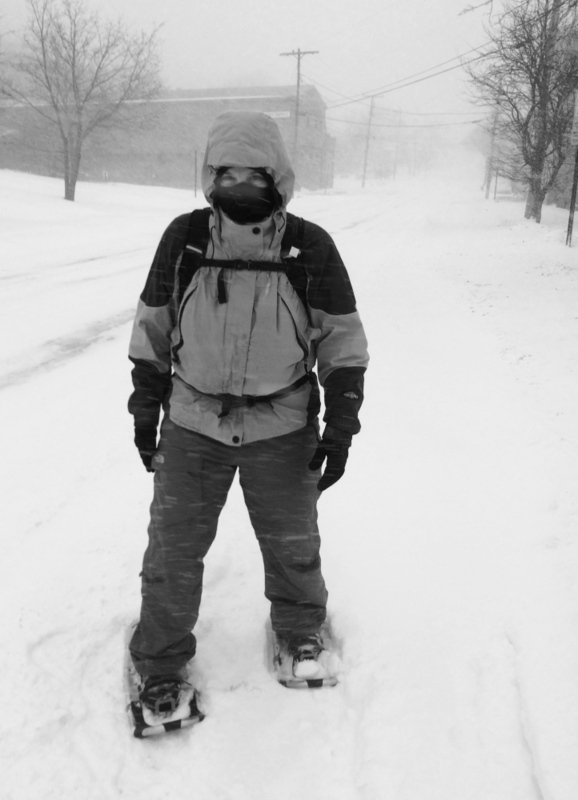 He spent the morning snowshoeing around Munjoy Hill, where his girlfriend lives. At the top of the hill, Emmett Naylor delivered fresh bread to Rosemont Market, which opened a couple hours late at 10 a.m.
Naylor said he decided against driving out to the suburbs to make deliveries to Rosemont’s store outside of Portland. “Yarmouth doesn’t need bread today,” he said. On the other side of Congress Street, the Hilltop Superette already had sold a couple of bottles of champagne before 10 a.m., said general manager Nate Philbrick. Nichole Sequeira and Packy Malia, who both got the day off work, insisted they came to the store for syrup for pancakes. The six-pack of IPA they picked up was “for later,” Malia said. At 9 a.m., Mary Powers walked alone down Washington Avenue in Portland, heading toward Interstate 295. She had planned to drive to work, but when she stepped out of her house on the Eastern Promenade and saw two cars in a snowbank, she decided against it. Powers got out her snowshoes, her snow pants and parka and walked the roughly two miles to the rehabilitation facility on Baxter Boulevard where she works as a physical therapist. Gary Clark, 50, a driver for ASAP Taxi & Courier Service in Portland, started what he described as a very busy shift at 4 a.m. Tuesday and had driven about 20 fares by 10 a.m. Most of his fares were going to work, he said – nurses, hotel workers and Auto Europe employees. 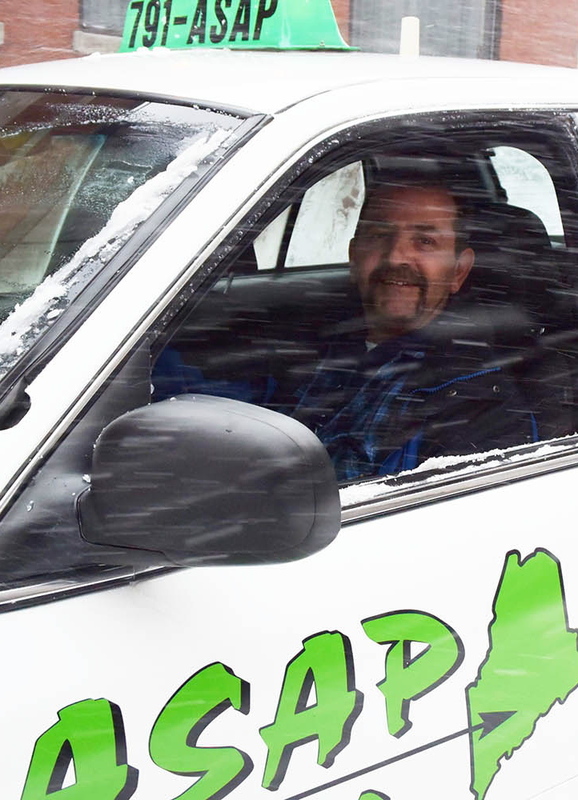 He described the city roads as “terrible, but passable.” He’s been driving a taxi since the mid-1990s and said Tuesday’s storm was by far the worst he’s encountered. He’d seen only one minor accident all morning, was surprised to see a bicyclist pedaling along Congress Street, and encountered several pedestrians walking in the middle of the road. In the Willard Beach and Meetinghouse Hill neighborhoods of South Portland, roads had been plowed by the normal morning commute time, but cars and people were scarce. Cottage Road, usually jammed with cars heading from Cape Elizabeth and South Portland into Portland, was eerily quiet. One could wait five or 10 minutes and see just a single car motoring past. Blowing snow and wind reduced visibility to a less than 100 feet at times. Still, a few people were clearing their driveways and sidewalks Tuesday morning, trying to stay ahead of a storm that was predicted to drop 18 to 24 inches of snow in Greater Portland. Karen Moulton, 49, began using a snowblower to clear her driveway on Bellevue Avenue in South Portland around 8 a.m. Tuesday, when the temperature was about 11 degrees. Her face was flecked with tiny snow crystals after about 30 minutes on the job. Her 4-year-old Labradoodle, Bug, was chasing the powder blown from the snowblower and jumping into drifts. Moulton was home from work – she runs a graduate research lab at the University of Southern Maine – and said she was planning to clear snow again later in the day. Despite the low temperature and fierce wind, she enjoyed the beauty of the snow and the quiet streets. “I like the silence,” Moulton said. In the common area of the men’s dormitory at the Greater Portland YMCA, everyone was in sandals. No one had any intention of leaving. “I don’t like it,” Ayman Musa, 23, said off the snow. The Sudanese refugee was supposed to go to class Tuesday at Portland Adult Education, which was closed, like everywhere else. So instead, he watched YouTube videos of English lessons on a tablet. Musa came to the United States a year ago, first landing in Richmond, Virginia, before coming to Maine. After the blizzard Tuesday, “I’m thinking about Texas, Florida,” he said, laughing. He insisted he was just kidding. 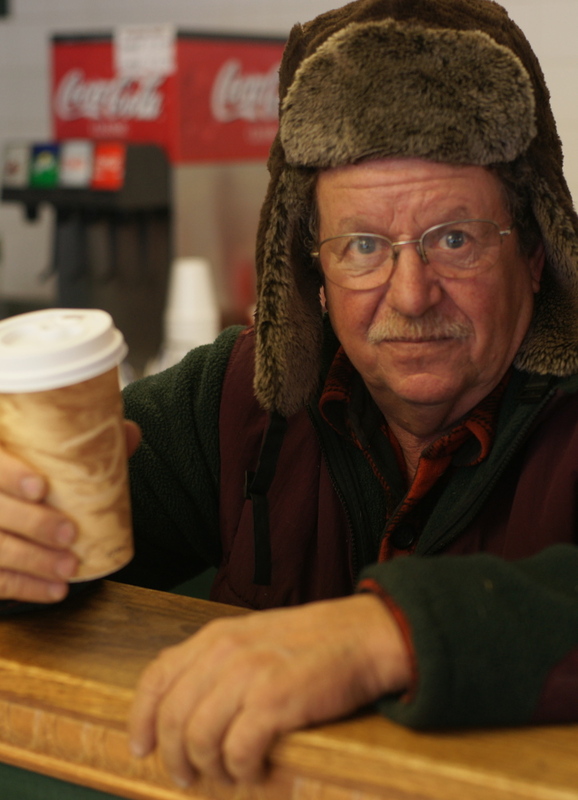 Joe Raynes of Cumberland ventured forth to Cumberland Farms in Yarmouth just to get a cup of coffee. He said his four-wheel-drive Chevrolet pickup was up to the task, but it wasn’t pretty. 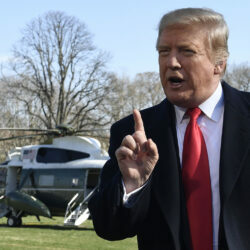 “This is the biggest one we’ve seen in a long time,” he said. In Berwick, strong winds packed Route 9 with waist-deep snowdrifts in places. The only people on the roads were plow crews, which struggled to keep the primary roads passable. Cumberland Farms was among the handful of businesses open, and employees said they intended to stay open as long as the business had power. Commodities most in demand Tuesday morning: Gas and coffee. Jody Perault, who lives in nearby New Hampshire, filled up on both. A private plow operator, he planned to keep up with the snow as long as he could. In Old Orchard Beach, the winds were whipping snow into 3-foot drifts in some spots, said Mary Eskew, who owns Hoss and Mary’s restaurant with her husband, Hoss Coddens. The area was deserted just before 9 a.m. Tuesday, except for the occasional passing snowplow. “You can’t see the ocean at all, and we’re oceanfront,” Eskew said. Hoss and Mary’s is normally closed Tuesdays, but Eskew and Coddens decided to open during the storm in keeping with their tradition of serving food when other restaurants are closed.